iLuv iMM178DAB Vibe Plus review | What Hi-Fi? The sticker on the box for the Vibe Plus claims it costs £99.97. A strange price to plump for, perhaps, but also an easy one to ignore. We’ve found it online at a number of reputable sources for less than £70. And, to give it a fair crack of the whip, that’s the price we’ll be testing it at. 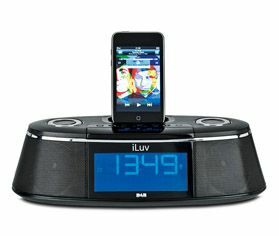 This is a dual alarm clock with FM, DAB, and an iPod dock. It also has an intriguing extra – the ‘bed shaker’. This proves to be a plug-in speaker that you can slide under your pillow for private listening, or for a vibrating wake-up without disturbing your partner. DAB reception is strong enough and we didn’t have any problems setting things up. Initial impressions of the sound are encouraging: for voice radio in particular, this is a pleasing listen, clear and crisp without being too strident. It suffers a touch with music, though, in comparison with the five-star Pure Chronos II dock (available for around £30 more)..
It’s just a little tinny in comparison, and lacking in some bass presence. The same is true with iPod performance. It also lacks the auxiliary input and the iPod track-listing of the Chronos. All in all, though, this is a perfectly decent product that does a perfectly decent job.